Kamboja was the ancient name of a country, and the Indo-Iranian warrior tribe, the Kambojas, settled therein. The country is listed as one of the sixteen Mahajanapadas or great nations in ancient Buddhist texts, and was located in the Uttarapatha in extreme north-west of the Indian sub-continent, contiguous to the kingdom of Gandhara. It initially included the Pamirs, Badakshan, and territories as far as the Zeravshan valley in the doab of Oxus/Jaxartes. It approximated what is known today as the Galcha speaking region of Central Asia. Later, some sections of the trans-Hindu Kush Kambojas moved to southern side of the Hindukush and planted colonies in Kunar/Swat and as far as Rajauri in Kashmir. The Kambojas are attested to have had Indian as well as Iranian affinities (Macdonnel, Keith, W. K. Fraser, M. C. Gillet, etc). Kamboja (or Kambuja) is the name of an ancient Indo-Iranian tribe of Indo-European family, believed to be located originally in Pamirs and Badakshan in Central Asia. The Sanskrit name Kamboja is also sometimes found written as Kambuja as in Vedic texts like Paraskara Grhya Sutra (2.1.23). Kambojas is the plural form of Kamboja. The etymology of Kamboja or Kambuja is unclear. There are several views regarding how the name Kamboja/Kambuja may have originated. Probably from the name of legendary Indo-Iranian warrior named Kamboja, (placed at 12th generation from Swayambhuva Manu) of Indian traditions. This Kamboja had won the prized Khadaga (Divine Sword) from Kuvalashava, the celebrated Monarch|king of Kosala ( MBH 12/166/77). It is probable that Kamboja of Shantiparva (Mahabharata) was some very earlier Kambujiya or Kambujiya |Kamboujiya of Persian traditions. Yasaka of seventh century BCE has attempted to etymologize Kamboja by defining it as Kambal.bhojah and Kamaniya.bhojah. According to Nirukuta (II/2), the Kambojas enjoy kambalah (blankets) i.e they are Kambal.bhojah, and also they enjoy beautiful (kamaniya) things i.e they are 'kamaniya.bhojah'. Hence they are called Kambojas. According to scholars like Dr Moti Chandra, Kamaniya.bhoja of Yasaka literally means Handsome Bhoja. Now Bhoja is an aspirated Sanskrit equivalent of Iranian Boja and it means 'king' (Dr Pirat, Dr K. Elst). This suggests that Kambojas may have been so called because they were a very handsome race, or else, because their kings were very handsome. This view is abundantly reinforced by Valmiki Ramayana (1/55/2) as well as several verses of Mahabharata (MBH 7/23/43; 7/82/74; 8/56/113-114) etc which strongly testify that the ancient Kambojas and their princes were very handsome. According to another view, the name Kamboja derives from expression Kam+Boja, where 'Kam' implies region and 'Boja' implies owner, lord or king. Thus the Kambojas were the Owners, Kings or Lords of a cetain region or country called Kam, hence they were called Kam.boja or Kam.bhoja (Dr H. C. Seth). The affix Kam reflected in the Kama valley lying between Khyber Pass and Jalalabad, the place names like Kama-daka, Kamma-Shilman, Kama-bela of Kabol, the Kamdesh/ Kambrom, Kamich, Kama and Kamu of Kunar/Bashgul valleys as also the vast expanses of region called Kazal-Kam and Kara-Kam lying on either side of Oxus, north of Afghanistan, may truly reinforce this view. 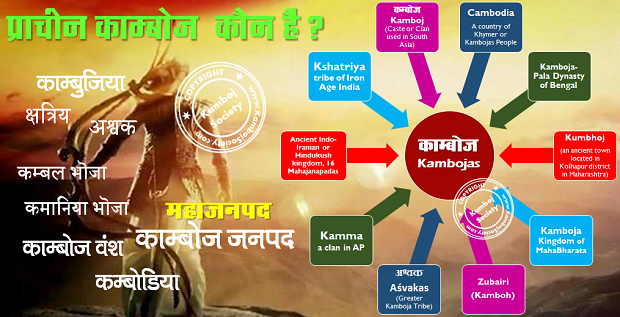 It is important to note that ancient Kamboja was located precisely in/around or contiguous to these Kam localities. Scholars like Casey suppose that Kambuja lineage of the ruling family of ancient Cambodia originated from their legendary patriarch figure called Svayambhuva Kambu. Per Casey, etymologically: Kambu+ja => Kambuja, where 'ja' in Sanskrit is said to mean son or descendent..hence Kambujas = descendents of Kambu. On similar lines, some people etymologize Sanskrit Kamboja as Kambo+ja arguing that the name of Indo-Iranian Kambojas may have eponymously originated from some ancient patriarchic figure known as Kambo. The Kambu as a name of an Asura (Iranian) clan is attested in ancient Hindu texts like Markendeya Purana (8.1-6) and Devi Mahatam (5.28.1-12), where the Kambu (Kamboja) clan is portrayed in clash with the Indo-Aryans. It is notable that King Ashoka 's Rock Edicts (3rd century BCE) located in Peshawer also write Kamboy (i.e Kambo) for Sanskrit Kamboj. It is also notable that terms Kambo and Kambu have also been used in medieval era Muslim writings for the Kamboj population of greater Panjab. A more acceptable view is that the name of the tribe and their country had originated eponymously from their illustrious ancient warrior king called Kamboja. This legendary Kamboja warrior had won the prized Daivi Khadaga (Divine Sword) from celebrated king Kuvalashava of Kosala ( MBH 12/166/77). The sword legend of Mahbaharata points to very remote antiquity since king Kuvalashava, the contemporary of this Kamboja, has been placed at twelfth generation down from Swayambhuva Manu of the Hindu traditions (Ancient Indian Historical Traditions, pp 114 ff, Dr P. E. Pargiter). It is now accepted that the royal name Kambujiya (or Kamboujiya) is the Iranian version of Sanskrit Kamboja or Greek Cambyses and, it has been a very popular name among the ancient Iranians. It is probable that the legendary warrior Kamboja referenced in Shantiparava (Mahabharata) was some earlier Kambujiya from royal line of ancient Iranian Aryans, who had given his name to his clan. Camboja is the Portuguese language|Portuguese name for Cambodia. Kamboja is also the Indonesian name for Cambodia. Name of an ancient Indo-Iranian warrior clan of Indo-European family. Name of ancient nation founded and ruled by Kambojas. The prince of the Kamboja Nation or Tribe (Panini, IV.1.168-175). A descendant of the Kamboja Kshatriyas (Panini, IV.1.168-175). A horse raised and bred in ancient Kamboja (also Kambojaka, Kamboji) (See: Halayudh Kosha). An elephant native to, or coming from, Kamboja (also Kambu) (See: Nanaratha.manjari-421). Silver or gold native to, or coming from Kamboja (also Kambu). Name of a conch or shell native to Kamboja (also Kambu). Name of Supari or Punnag (Rottleria tinctoria) native to or coming from Kamboja (See: Shabd.rattan.samanyavakosha). Name of Somavalak or Karanj native to or coming from Kamboja (See: Shabd.rattan.samanyavakosha). Name of Ayurvedic herbal medicine Mashaparni and Hingparni, imported from Kamboja (also called Kamboji) (See: Shabd.rattan.samanyavakosha). A gold or silver bracelet, or bracelet in general (also Kambu). Name of a mountain located in ancient Kamboja (Afghanistan), famous for its Kambu or Kambuka silver (Kautiliya Arthashastra, 02.13.10). Silver mines of Anderab, Wakhan and other locations in Badakshan were noted during Arabic rule (Geographical and Economical Studies in the Mahabharata, Upayana Parava, Journal of U.P. Historical Research Society, Vol XVI, Part II, p 46, Dr. Moti Chandra). Therefore, Kambu appears to be the name of a range of the Hindukush mountains in south-east Badakshan. Kamboji: the language of the ancient Kambojas. Born in, coming from or relating to Kamboja or the Kambojas. Some Time/Space Variants of "Kamboja"
Kaamboja (In the Ramayana, Mahabharata and Vedic civilization|Vedic literature etc., hence Kaamboj). Kambhoja (Southern Indian texts, as in Kautiliya's Arthashastra, hence Kambhoj). Kaambhoja (In Southern Indian versions of ancient Sanskrit texts, hence Kaambhoj). Kumbhoja (Same as Kambhoja; name of an ancient town in Maharashtra; also, the name of an ancient Kamboja sage referenced in some recensions of the Ramayana). Kambuja (as in dakshinatah Kambujaa.naam Vasisthaa.naam: See Paraskara Grhya-Sutram (2.1.23)). Kambuj (one from Kambuja, like a Kamboj is from Kamboja). Kaanboja (a variant of Kamboja; See Triya Chritra 217/verse 14 of Chritropakhyana of Dasam Granth; Hence Kaanboj). See also pages 21-23 of [https://www.gobindsadan.org/institute/dasam/pdf/v5_1.pdf]. Kanbuj (as in a coin: Kharal-putras Kanbuj Raspag: See Bharat ke Prachin Mudrank, by Swami Om Nand ji Sarasvati, 1973, Rohtak. Apparently Kanbuj is a variant of Kambuj/Kambuja, since m easily becomes n in Indo-Aryan languages, e.g Kambujiya = 'Kanbujiya). Kabuj (See Triya Chritra 217/verse 14 of the Charitropakhyana of Dasam Granth Sahib. Dasam Granth attests the term Kabuj as well as Kaanboj). Cambuja (Variant spellings of Kambuja). Kamboza (As in the name of the Kamboza-thadi Palace of Bayintnaung, Myanmar). Kamoz, Caumoje, Camoje (Pushtu names for a clan of the Siah-Posh Kafirs of the Hindukush). Kamtoz (Another Pushtu name for a Katir clan of the Siah-Posh Kafirs of the Hindukush. Said to be a variant of Kamboz). Kambu (As in the name of an Asura clan, in conflict with Vedic Aryans, as referenced in (Markendeya Purana (8.1-6), Devi Mahatam (5.28.1-12)). Kaaboja (See Luders' Inscriptions No 176, 472. It references a Kamboja Buddhist Bhikshu from Nandinagar of ancient Kamboja). Kabojha or Kabojhiya or Kabhojika (In ancient Sinhalese cave inscriptions). Khamboja or Khaamboja ((Sometimes) Southern Indian spellings of Kamboja). Kamboda, Kambhoda (alternative name for Kamboja or Kambhoja Raga; also Kambodi or Kambhodi). Kambojaka or Kambojika (Buddhist texts). Kamboika, Kamboi (name of a "landlocked port" town in Gujarat. Tenth century Grant records of Chalukya rulers show it as Kamboika (See Indian Antiquary VI, 1877, pp 191-92). The name is said to be a corruption of Pali Kambojika or Kambojaka. Kau-fu (equivalent to Kambu; the Kamboja of Hiuen Tsiang: Dr. R. K. Mukerjee, Dr. Law). Kieu-feou (name of Kamboja in the Chinese language|Chinese recension of Tathagata Grhya-Sutra (Ratnakutsangraha). Kam-po-ce or Kam-po-ji (name of Kamboja in the Tibetan recension of Tathagata Grhya-Sutra (Ratnakutsangraha). Kambocha (as in Ashoka's Rock Edicts of Bhubneshwar, Orissa). Kamboi & Kamoi (as in some ancient Sikh writings, like those of Giani Gian Singh. cf Kamboy of Ashoka's Shabaazgarhi Edicts). Kambuh or Kanbuh (variants of Kamboh/Kanboh. In medieval Muslim writings). Kumbho (same as Kambho, obviously from Kumbhoj). Kumboh (as in The Martial Races of India, p 251, Sir George Fletcher MacMunn. Same as Kamboh). Kamo ("Ultra-prakrit/vulgate" form of Kamboj, used in the illiterate circles of Punjab region|Panjab). Komoi (a Ptolemian name for a tribe north of Bactria/Badakshan in Central Asia. Perhaps from Kamboi, which may be an alternative of Kamboika / Kamboyika /Kambojika). Ambautai (from Kambautai, Ptolemian transliteration for Kamboja, a people/region in Paropamisadae, south of Hindukush (Dr. M. Witzel). Sanskrit Kamboja appears as K.b.u.ji.i.y, Kabujiya or perhaps Kabaujiya/Kaboujiya and K ambujiya or perhaps Kambaujiya ( OR with -n- in place of -m- as Kanbujiya or Kanbaujiya) of Old Persian Empire|Persian inscriptions, and Cambyses of Greek language|Greek writings. The same name appears as C-n-b-n-z-y in Aramaic, Kambuzia in Assyrian, Kambythet in Egyptian language|Egyptian, Kam-bu-zi-ya or Ka-am-bu-zi-ya in Akkadian language|Akkadian, Kan-bu-zi-ia or Kan-bu-si-ya in Elamite, and Kanpuziya in Susa|Susian language (cf: Ancient Kamboja in Iran and Islam, p 69, Dr H. W. Bailey). It appears to have been quite a popular name among the ancient Iranians, of whom the ancient Kambojas are said to have formed a clan.